I just returned from a writer's conference in San Miguel de Allende, Mexico, which included keynote speakers ranging from Judy Collins, to national poet laureate Billy Collins (no relation) and on to award-winning journalist Naomi Klein. They were all amazing but the person I was meant to meet was Canadian documentary filmmaker Avi Lewis. Lewis turns out to come from a line of New Democratic Party leaders in Canada and is the former host of the Canadian Broadcasting Corporation current-affairs programs CounterSpin and On the Map. Now, he's at the forefront of the Leap Manifesto, a grassroots effort to put Canada at 100 percent renewable energy by 2050. However, the Leap Manifesto is more than climate and clean energy, it's about job creation for the middle class, protecting indigenous rights, standing up for education and health care, and encouraging more localized agricultural systems. It's a holistic, aspirational approach that responds simultaneously to caring for the earth and caring for one another. Best of all, it comes with a plan to pay for it all … a carbon tax that gives back. Lewis explained that the Leap Manifesto came about as a response to the low oil prices and the subsequent economic ripple effect in Canada. "The drop in oil prices temporarily relieved the pressure to dig up fossil fuels as rapidly as possible and it gave us pause to look at what we have become — and decide to change," Lewis said. "Alaska is experiencing the same disruption due to low oil prices. Alaska too has the same opportunity for transformative change; for bringing in a tide that floats multiple boats." To help ensure that the Leap Manifesto is doable, the organizers aligned themselves with the "Sustainable Canada Dialogue," a forum that included policy recommendations agreed upon by 60 scientists from all corners of Canada. Here in Alaska we may not be leaping, but thanks to an organization called the Renewable Energy Alaska Project, we have firm ground to consider leaping from. Since helping to establish the Renewable Energy Fund in 2008, REAP has been on the frontline of getting renewable energy projects started. From 2008 to 2015, the state of Alaska appropriated $257 million for renewable projects throughout the state, leveraging another $200 million in federal and private funds. According to the Alaska Energy Authority, in just the first three quarters of 2016 projects built through the fund saved Alaska communities over 21 million gallons of diesel fuel costing about $44 million. Back in 2010, REAP played a key role in securing a state legislative policy to improve energy efficiency on a per capita basis. That policy also set a goal for 50 percent of the state's electricity to come from renewable sources by 2025. In 2010, this was forward-thinking energy policy. But for 2017, in light of pressing climate events (2016 was the hottest year on record and a 17-mile expanding ice crack in Antarctica does not bode well for sea level stability) and significant breakthroughs in renewable energy (wind and solar are now cheaper than coal and natural gas in many areas) these goals are too modest in a time of great urgency … hence the need to leap. Can we Alaskans model our neighbors in developing our own Leap Manifesto for more renewable energy? When I asked Chris Rose, executive director of REAP, this question, he replied, "Alaska has a huge wealth of efficiency and renewable energy resources. If we can muster the political will to capitalize on these inexhaustible energy resources, Alaska could become a world leader in clean energy development. In the process, we would create thousands of good-paying jobs, export our expertise to the world and keep hundreds of millions of dollars in our economy every year that we're now wasting through a variety of inefficiencies. Since energy touches every part of our lives, organizations working on issues like education and health care would also benefit from an effort like Leap Manifesto in Alaska." 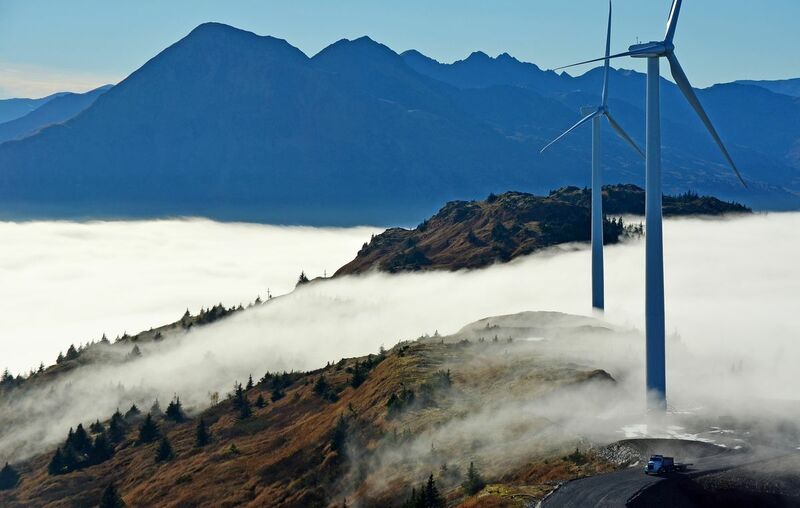 Thanks to organizations like REAP and Alaska Village Electric Cooperative there are now 28 wind installations operating in rural communities outside the Railbelt. These installations not only provide scores of jobs in areas desperate for year-round employment, but also allow communities and utilities to reinvest those saved diesel dollars back into their respective communities. Additionally, Alaska has 45 hydro projects, making hydroelectric power Alaska's largest source of renewable energy, supplying nearly 25 percent of the state's electrical energy. We're halfway to our 2025 goal and adding jobs in our villages already. Given the state of our economic recession, I believe we're at a place where the dialogue over energy can expand to a greater public good. But, and here comes the big BUT — we need to fix the state's fiscal crisis first. This I know. Hopefully the Alaska State Legislature will end this legislative session with a solution in hand. Meanwhile, why not consider leaping into the clean energy economy in a way that spreads the largest blanket of civic benefits to Alaskans? I never knew this was possible until I bumped into the person I was supposed to meet — Avi Lewis, husband to Naomi Klein. Lewis and the over 200 signatory organizations are now expanding their efforts by helping other countries and regions follow their model in developing similar manifestos. Efforts are underway in Australia, Great Britain and in the state of Maine. Lewis assures me they are on standby to assist Alaskans whenever they are ready. "We feel strongly that this process should not be led by any political party, no matter how aligned their policies are," cautions Lewis. "This is where the Leap Manifesto can come in and help boost the effort of local Alaskans." Kate Troll, a longtime Alaskan, has 22 years of experience in coastal management, fisheries and energy issues. She is a former executive director of United Fishermen of Alaska and Alaska Conservation Voters, and has been elected to local office in Ketchikan and Juneau. She now serves of the board of directors of REAP. Kate Troll, a longtime Alaskan, has over 22 years experience in coastal management, fisheries and energy policy and is a former executive director for United Fishermen of Alaska and the Alaska Conservation Voters. She's been elected to local office twice, written two books and resides in Douglas.